The increase in public support for full cannabis legalization is not just fueled by strong belief that cannabis users should not be prosecuted (New Frontier Data’s research found that 90% of Americans opposed treating cannabis consumers as criminals). 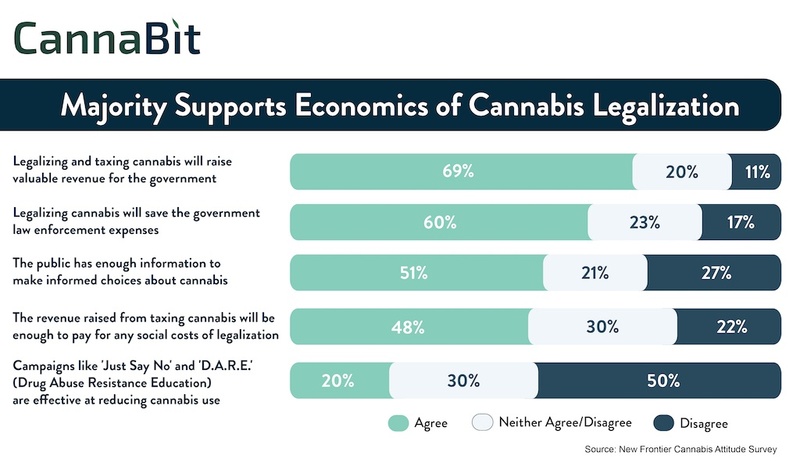 There is also growing confidence that legalization can produce strongly positive economic results. According to New Frontier Data’s latest nationwide Cannabis Attitudes Survey, a large majority (69%) of participants believe that legalizing cannabis can produce valuable revenue for the government. A case in point is Colorado, which has raised nearly $260 million in tax revenues since its adult use market was activated in 2014. The cannabis tax revenues in Colorado have been used to fund a range of programs, including $119 million applied toward school construction, over $7 million put toward substance abuse prevention programs, and nearly $1 million used to fund cannabis research grants. At a time when many state governments are facing growing demand for government services despite shrinking budgets and few options to increase revenue, the activation of the cannabis industry not only offers a source of new direct government revenue, it can also catalyze economic growth through all the businesses opportunities it creates, thereby indirectly generating additional substantial revenue for jurisdictions. The public also believes that legalizing cannabis can reduce the significant expenditures associated with cannabis prohibition enforcement. However, as seen in the active adult use markets, any savings in prohibition enforcement costs may be offset by the significant costs associated with regulating the newly legal industry, including pursuing and prosecuting those exploiting the umbrella of the legal industry to divert product into the illicit market. One difference, however, is that while cannabis prohibition is largely funded directly out of the state or municipal budgets, the regulatory bodies needed to oversee the cannabis industry can be funded directly by the revenues generated by the industry. Approximately half (48%) of those surveyed believe that revenues from cannabis legalization would be substantial enough to cover the costs of regulating the industry – something which has been found true so far in both Colorado and Washington. One widely held concern with legalization is that it will lead to increased cannabis use among minors. While this has not been borne out by Colorado, where teen use has remained relatively flat since legalization, it does reflect the public support for drug education and substance abuse prevention programs. Nevertheless, the public is largely skeptical about some of the more famous drug education campaigns, including the Just Say No and Drug Abuse Resistance Education (D.A.R.E.) programs. Only 20% believe those programs to be effective in reducing cannabis use, while 50% find them ineffective. This suggests that the public is ready for a new approach to drug education, with programs that reflect the growing body of science on cannabis, the dramatic shift in public perceptions over the past 20 years, and the sophistication of the digitally connected, marketing-savvy adolescents to whom the programs are aimed.